This second vegan menu plan is great for people who really want to eat healthy and avoid meat, but don't have time to cook every meal. Maybe you have a hectic work schedule, or kids to cart all over town. Or maybe you just don't really enjoy cooking. This meal plan is designed for people who go out to eat for lunch often and call for take out for dinner. You can learn to cook a few of these meals if you have extra time, but they are made for ordering in restaurants. Also, keep in mind that if you live in a big city, you are probably blessed with many vegetarian-friendly or even fully vegan restaurants. I've found them in the most unlikely cities, and I adore eating at different places around the world, so make sure to search around when you start your vegan diet. Eventually you are probably going to want to learn a few great dishes, and when you are ready you can start to combine with the first vegan menu plan, or a more comprehensive menu plan, including recipes, pictures, nutritional data, and weekly grocery lists, like our Fall and Winter vegan meal plans as well as our Spring and Summer vegan diet plans. For now, here are some great ideas for how to eat on the second vegan menu plan, what I dubbed the "I don't have time to cook" menu. 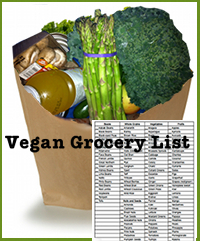 Get a blank, reusable vegan grocery list for $0.99.